Thanksgiving is on 23rd November and is a massive celebration. Friends and family get together for meals and Thanksgiving Parties. We have lots of popular Thanksgiving Ideas to help you put together an amazing Themed Thanksgiving Party. These include USA Themed Decorations, American Flags and American Accessories to wear which all add to the mood of a Thanksgiving Party. Thanksgiving in America is on 23rd November and falls on the fourth Thursday of November giving thanks for the blessing of the harvest. Thanksgiving is just as significant to lots of Americans as Christmas and families and friends get together for a special meal usually consisting of Turkey with all the trimmings and Pumpkin Pie. 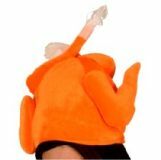 An Inflatable Turkey Leg to use as a decoration and wearing a Turkey Hat to serve are perfect to add to some fun to your dinner. Many Government offices as well as businesses and schools are closed on this day and many also close on the Friday following Thanksgiving as well giving a long weekend. There are Parades in many cities and this also starts the beginning of Christmas shopping. If you cannot be in America for Thanksgiving then you can still celebrate and bring Thanksgiving to you. Thanksgiving Decorations really set the scene for this traditional day and we have lots of ideas to get you going. Decorating your home with Thanksgiving party products such as a Star Cascade, Dollar Sign Whirls and a USA Star Stringer sets the tone for an amazing Thanksgiving. Flags such as an American Flag or American Truck Flag look patriotic and a USA Table Flag makes a fantastic table decoration. USA Hand Held Flags are perfect to wave at any Thanksgiving Parade or Thanksgiving Party. We have lots of American Themed Cutouts for you to choose from, these include Miss Liberty, Washington DC, American Flag and Big Bucks all of which look really impressive. USA Themed Party Packs are a really popular choice with all you need and make choosing Thanksgiving party supplies effortless. A Thanksgiving Themed Party creates a fantastic atmosphere and wearing USA themed accessories such as a Stars and Stripes Headbopper, a Glitter Stars and Stripes Cowboy Hat and Jumbo Dollar Glasses look cool. If you are having family and friends for a meal our range of American themed disposable tableware is ideal. Choose from Stars and Stripes or Barbeque for a striking look. Have you started planning Thanksgiving yet? We would love to hear how you are spending Thanksgiving this year.